The land on which Marine Home Center is located was originally part of the West Monomoy subdivision laid out by the proprietors in 1726. Although at the edge of the town, this area held several early houses by the 1750s and the Walling Map indicates scattered development along Orange Street at the site by 1834. This development included the homesteads of Benjamin Manter, mariner, and Caleb Cushman, which comprised most of the current Marine Home Center property. In 1871, the “homestead of the late Caleb Cushman” was purchased by the Burgess family, who held the property into the twentieth century. In 1895, with a bicycle-racing craze hitting the island, Eugene S. Burgess constructed a quarter-mile bicycle racetrack known as Centennial Park Bicycle Track on the property. According to the Inquirer and Mirror, the park also included a grandstand, tennis courts, and baseball grounds. The success of Centennial Park appears to have been short-lived, and in 1928 Burgess sold a portion of the property to the Sears Lumber Company of Middleboro, which used the site as a lumber yard. The company had supplied building materials to the island for at least a decade prior, and sold the facility to their on-island employee, Howard U. Chase, during the height of the Great Depression. Chase operated the yard as the Chase Lumber Company until 1944 when it was relocated and the property sold to the Marine Lumber Company—part of the Island Service Company Nantucket’s main supplier of ice, lumber, coal and fuel oil. For much of its history, Marine was held by Walter Beinecke Jr. as part of Sherburne Associates and was managed by Albert “Bud” Egan before Egan acquired it in 1966. Like its predecessors, Marine started out as a lumber supplier, but the firm diversified to offer a host of products and services. Over the years, Marine opened the first garden center, the first home center, and the first modern department store on island. This expansion offered customers the opportunity to shop for not only building supplies, and home and garden products, but specialty items. A wine and cheese shop, hairdresser and high end dress shop were among its departments. Expansion began in the 1950s with the addition of a downtown hardware and appliance store and a flower shop along Petticoat Row. 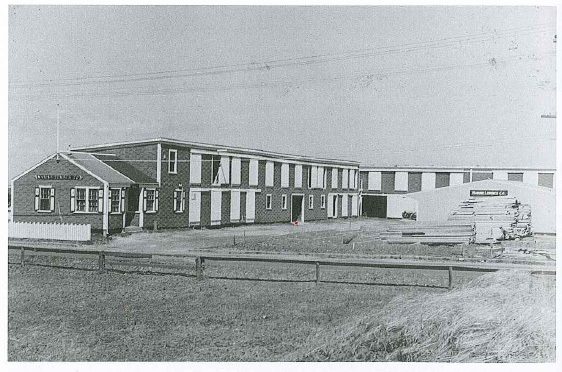 In addition the lumber division expanded by building panelized homes such as those found today along Goldstar Drive. The original site also grew to house these new services and included the purchase of the former Colonial Craft Shop—a millwork shop— located just east of the lumber yard. In 1966 a new building with large display windows was constructed to display its products and many services. In 1973 the company changed its name to Marine Home Center, and in the 1980s it expanded across Orange Street where its kitchen design and appliances sales are located. 56 Centre Street is currently in the process of renovations taken on by ReMain Nantucket. Upon completion ReMain’s goal is to create a new home for the Nantucket Community Music Center and a downtown campus for the Nantucket Community School. 56 Centre has a very unique history, prior to it’s current renovation status. Read below to learn the property’s history through its owners, dating back to 1843. Harrison Gray Otis Dunham, one of Nantucket’s successful whale-oil merchant, married Sophronia Edwards Gardner, the widow of whaling captain Albert C. Gardner, in 1843. Dunham, a widower himself, purchased the old Shubael Gardner house from Thomas Bunker that same year. Dunham removed the building and constructed a new house at 56 Centre Street, perhaps as a wedding gift for Sophronia. The new home was designed in the popular Greek Revival style with a fine classical entry and large central hall that were common features of homes of the merchant class. Records show that Dunham was one of the town’s prominent citizens and operated his own successful business known as H.G.O. Dunham & Company. The firm owned at least one ship named the Nantucket which was built at Brant Point in 1836-1837 and had over twenty years of successful Pacific voyages before wrecking off the Elizabeth Islands in 1859. The 1850 U.S. Census indicates that the Dunham household included a large extended family. 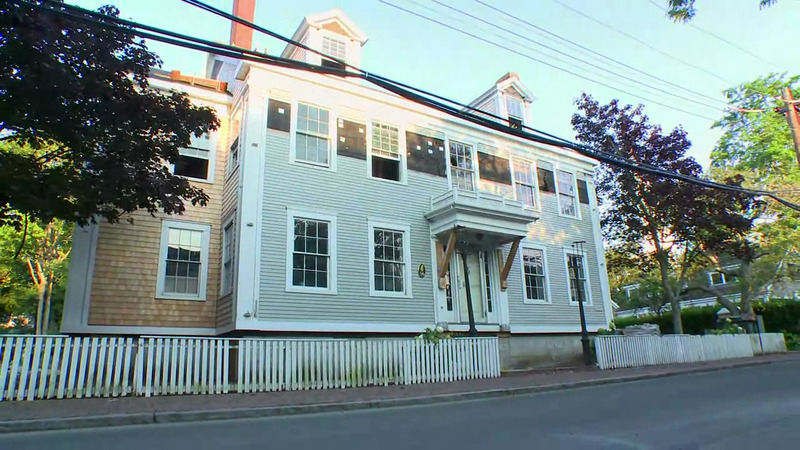 All of Harrison’s children from his first marriage lived at 56 Centre including: Joseph age 27, cooper; Charles H. age 24, butcher; Ann E. age 20; William age 18, shipwright; and James age 15, student; as well as Sophronia’s daughter, Sarah Gardner age 15; and Harrison’s and Sophronia’s three children, Martha W. age 5; Harriet K. age 2; and Harrison Jr., age 7 months. In addition, the household included Dinah Dunham age 82 (possibly Harrison’s mother); and Nancy Carr and Mary Finn (most likely domestic servants). Harrison and Sophronia, their youngest daughter Harriet, and one servant formed the household in 1870. The other children had married and moved elsewhere on island or on the mainland. On June 28, 1877, “Judge” Harrison Dunham, age 79, died and the property at 56 Centre Street passed to his wife of 44 years. Sophronia Dunham remained at the house and active with the Nantucket Relief Association, an organization founded in 1873 to assist “indigent, aged people in our midst”. Four of the Dunham-Gardner children inherited the house from their mother and they sold their shares to one another in the period 1885-1891. Sarah Gardner Penniman sold her one quarter share to her younger half sisters and brother on December 7, 1885. With the sale, Harrison and Sophronia’s children became the owners, including Martha Dunham Summerhayes of San Francisco, California, Harrison G.O. Dunham, Jr. of New York City, and Harriet K. Dunham of Nantucket. Four years later Martha sold her share to Harrison and Harriet who together retained the house until 1891. Martha Dunham, the eldest child of Harrison and Sophronia, was born on October 21, 1844. In the early1870s she traveled to Hanover, Germany where she lived with friends. In 1872 she was joined by her younger sister Harriet. Martha returned home and married Nantucket native Lt. John Wyer Summerhayes on March 16, 1874, but her travels continued. Immediately after their marriage Summerhayes, who had served in the Civil War and remained in the military, was posted to Arizona. Martha accompanied her husband out west traveling by ship to San Francisco and then to Fort Russell near Cheyenne, Wyoming before making their way along the Colorado River and through desert to their station in Arizona. The Summerhayes returned to Nantucket soon after the birth of their son Harry in 1875, but by 1878 were in California and were soon posted once again to Arizona. They continued to return east for extended periods until Summerhayes retired from the military in 1900. The1880 US Census lists the Summerhayes family as residing with Sophronia at 56 Centre. Their early adventure in Arizona was chronicled by Martha in her memoir Vanishing Arizona published in 1908. The book was highly acclaimed and Martha became a celebrity on Nantucket as well as throughout the country. The couple appear to have lived their later years in the New Bedford, but returned to summer in Nantucket. John Summerhayes died in 1911, and Martha died on May 12, 1926 in Schenectady, New York. She is buried with her husband at Arlington National Cemetery. As Miss A. B. Folger, in your last issue, requests the townspeople to express their sentiment in the matter of the changes in Main street Square, I wish to say that I regret sincerely all attempts to modernize or change the aspect of it, and I am decidedly “for the old”. The youngest child in the Dunham family, Harrison was born on October 17, 1849. He was a graduate of Nantucket High School, and soon after moved to the mainland where he became a merchant in the paint and oil trade with fellow Nantucketer Isaac Augustus Macy. The firm of Macy and Dunham was established in New York City and operated for over 40 years. In 1894, three years after selling the family home, Harrison married Julia Pinckey of New Rochelle, New York, where the family remained. They had three daughters, Elizabeth, Harriet and Julia and spent summers on island in a cottage they owned on North Avenue. Harrison died on December 24, 1943 at the age of 94. Caroline (Carrie) Allen Middlebrook, a New York City native, purchased 56 Centre Street from Harriet K. Dunham on September 2, 1891. It is unknown how she became acquainted with the island, but her lodging in1887 at the popular Sea Cliff was noted in the local newspaper. Like Harriet Dunham, Carrie Middlebrook was involved in local affairs and in 1895 lent her name to an advertisement in the Inquirer &Mirror appealing to voters of Nantucket to provide the right of municipal voting to women. Carrie Middlebrook’s attendance at social events, such as a 1902 Masque Ball and for a 1904 dinner in her honor aboard the yawl Normona –“decorated with lanterns for the occasion”, also were noted in local newspapers. Like the Dunham sisters, passport records indicate she traveled to England, Germany and Greece on extended stays. Carrie appears to have made improvements to the property and expanded her real estate holdings along Centre Street, purchasing adjoining property in 1899 and 1906, and consequently removing the buildings to form a large garden. Although she sold the house in 1912, Carrie Middlebrook continued to summer on island and acquired several parcels of undeveloped land along Baxter Road near Sankaty Head Lighthouse which she offered for sale in the 1920s. Florence Lang and Henry Lang were among the most influential summer residents in the early 20th century. The Langs, whose main residence was in Montclair, New Jersey, began summering on island in 1909, and Florence is credited with starting Nantucket’s art colony. They also were major art patrons and funded the construction of art museums and helped form museum collections in Montclair and Los Angeles. Beginning in the 1910s they purchased large tract of land along Washington Street and the wharves and turned the old shanties and other commercial buildings into studios that they rented to artists at modest rates during the summer months. Florence also founded the first art galleries on island for the artist to display and sell their work. The Langs also assisted the island in other ways, donating to charitable causes including purchasing the bell at the North Church, and children playground equipment at Jetties Beach; and completing commercial development, such as modernizing the old Swain lumber, coal and ice company into the Island Service Company. Under the Lang ownership this firm became the largest mercantile business on island, and was later acquired as part of Marine Lumber Company. With the death of Henry in 1930, Florence operated the business as well as an island realty company and a boat yard, while. The house at 56 Centre, appears to have been one of several residential properties they held on island. The Langs improved the property but by 1919 newspaper ads suggest it was a summer inn with “single rooms, with or without private baths, and two or three room suites” for let. The couple sold 56 Centre Street as noted in the May 20, 1920 issue of the Inquirer & Mirror: Mr. and Mrs. Arthur H. Pray, of Boston, have purchased from Mr. and Mrs. Henry Lang, the beautiful “colonial” residence at No. 56 Centre street (formerly owned by Miss Carrie A. Middlebrook). John K. Ayers, a plumbing contractor and Alice D. Hartley both listed on the deed as unmarried, purchased the property as joint tenants with right of survivorship on May 2, 1924. It is unclear why this unmarried couple bought the house together, but it is possible that Ayers, a successful businessman, purchased the house with the agreement that Hartley would receive the house upon his death in exchange for caring for him. Both Ayers and Hartley are listed in the 1930 U.S Census as residing at 56 Centre and as heads of their own households. Alice Hartley is noted as a widow and residing with her widowed elder sister, Lillie E. Baker. Records indicate Alice was born in Nebraska in 1873, and was widowed by 1910. At that time she resided in Omaha and took in lodgers at her home. By 1920, at the age of 46, she had moved east and was working as a servant in Newtown, Massachusetts for George Eddy, aged 77. Ayers died at the age of 66 on January 3, 1936 and his obituary notes his long illness as well as his standing as “one of the leading citizens of Nantucket”. He served on the Finance Committee and besides his plumbing business operated Pease & Ayers the largest garage on island as well as the proprietors of the ‘Sconset bus line. In December 1936, the Inquirer & Mirror reported that “Mrs. Alice Hartley has gone off island for the winter months” noting that she was traveling to Boston and New York before heading west”. Five years later Alice Hartley sold the house to Maud E. and George G. Haddon and moved to Riverside, California. Maud and George Haddon renamed the house “Haddon Hall” and resided here seven years. Maud was a leading businesswoman, originally operating out of her home on West Chester Street as early as 1927, and later running the knit shop on Federal Street before opening a dress shop at 48 Main Street. The house was sold to Maud’s sister Bertha Cassidy and her husband Henry, a state policeman, in 1948 and remained in the family until 1974. Cherry Cottage, a documentary directed by Dave Simonds was released at the 2013 Berkshire International Film Festival. 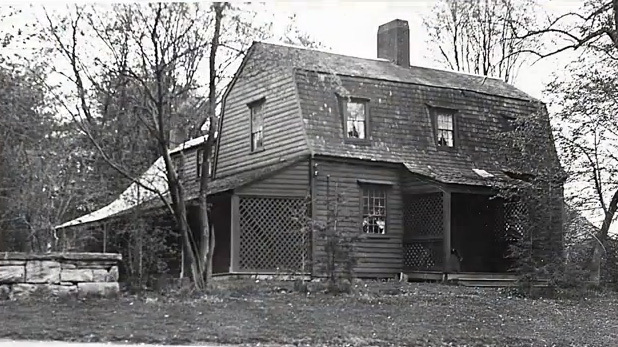 It focuses on a cottage located in Stockbridge, Massachusetts built in 1782. Hans Morris, a current neighbor to the property tells the story of not only the cottage itself but America as well. The cottage’s history is shown in connection with the history of America and its surrounding region. The story discusses how the Native American inhabitants and even hippies of 1960’s are intertwined with the cottage’s story. Click below to watch a trailer of this unique documentary. That ’Sconset was among the first summer resorts in the nation? Established as a fishing station in the late 1700s, its unique charm eventually lured many of Nantucket’s leading families to settle there on a seasonal basis. Beginning in the mid-eighteenth century, they would spend the spring, summer, and sometimes early fall in ’Sconset to fish, relax, and to catch a cool breeze away from the bustling town. Among those calling ’Sconset their home away from home were whaling captains’ families who summered in the historic fishing shanties along Broadway and Center and Shell Streets and prosperous whaling merchants several of whom built summer cottages along ’Sconset’s Main Street in the 1830s. ’Sconset was often home to retired mariners, including Benjamin Lawrence, a survivor of the ship Essex, as well as several “whaling wives”—those who accompanied their husbands on the long whaling voyages. It was not until the second quarter of the nineteenth century when the village became to lure large numbers of mainlanders for the season. By the end of the century the village became known as the Actors Colony due to the large number of Broadway actors and artists who summered there.